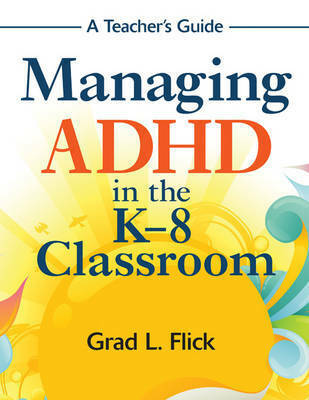 To help teachers gain a better understanding of ADHD, licensed clinical psychologist Grad L. Flick provides clear-cut behavioural intervention strategies for dealing with everything from general behaviour challenges to specific issues related to ADHD. Managing ADHD in the K-8 Classroom offers the latest research-based information about characteristics, assessment, and behaviours associated with ADHD, and provides appropriate options for responding to children's challenging behaviour. 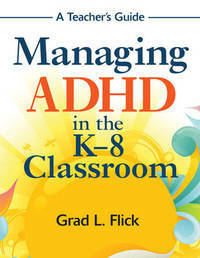 This valuable resource features case studies, checklists, graphs, and specific strategies that help general and special education teachers: - Make accommodations in the classroom - Promote appropriate behaviour and discourage inappropriate behaviour - Deal with children's impulsivity, attention problems, hyperactivity, difficulty following directions, and other problem behaviours related to ADHD - Use relaxation and stress management techniques that strengthen teachers' ability to handle behavioural challenges. Grad L. Flick is a licensed clinical psychologist in the states of Mississippi and Arkansas. He has specialization in neuropsychology and certification in biofeedback and stress management. He is also an EAP provider and has training in critical incidence stress debriefing. Flick has been in private practice for over 38 years and has seen thousands of children, adolescents, and adults. Currently, he is director of Seacoast Psychological Associates, Inc. and the ADD Clinic. The ADD Clinic offers assessment and treatment for children, adolescents, and adults who have ADHD. Flick has numerous scientific presentation and publication credits, has conducted many workshops for both parents and teachers on ADHD, and has given lectures to various parent and teacher organizations on ADHD and child management. Flick is the author of seven books on ADHD, including Power Parenting for Children with ADD/ADHD (1996) and the ADD/ADHD Behavior Change Resource Kit (1998). He has research and clinical experience with children who present attention, learning, and/or behavioral disorders. He has a doctorate from the University of Miami (1969) with an APA-approved internship in clinical psychology at the University of Florida Medical Center.